Great work is work that helps people. It’s not made great by accolades or praise from your peers… but by the experience of the people who actually use it. That’s work you can be proud of. Great work can be done by anyone. You don’t need to be “An Expert.” If you take the time to find out what people truly need, your work can help people now, and so you can do great work now. Great work is shipped work. Work that lives only in your brain or your hard drive can’t be great work. If you want your work to help people, you’ve got to get it into their hot little hands. Great work is work you can keep doing. If your work can’t sustain itself (aka with money and time off), you can’t keep doing it, which means you can’t keep helping people, and neither can your work. Great work takes care of you, so you can take care of it. Great work is never done. There can be nothing perfect on this planet. That means it’s not only perfectly fine to ship something that isn’t “perfect,” it’s mandatory. Every time you add to it or try again, you’ll do better, and it will become greater. Never forget! 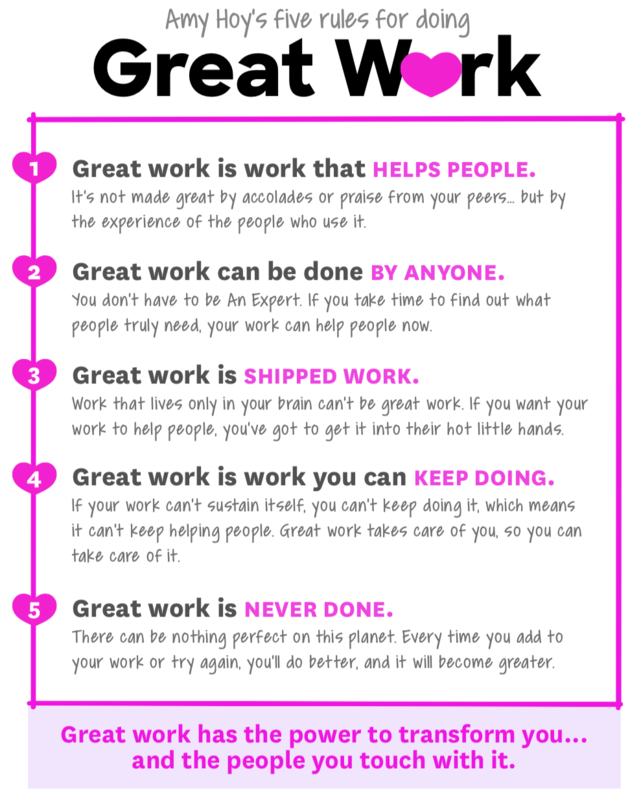 Print my 5 rules of Great Work and hang it on your wall. Get this list as a handy, printable PDF to keep you motivated.